(Nanowerk News) In a step that overturns traditional assumptions and practice, researchers at the Tata Institute of Fundamental Research, Mumbai and Institute for Plasma Research, Gandhi Nagar have fashioned bacteria to emit intense, hard x-ray radiation ("Enhanced x-ray emission from nano-particle doped bacteria"). When one thinks of hard x-rays and bacteria it is usually that the bacteria are at the receiving end of the x-ray source - being imaged, irradiated for some modification or simply assessed for radiation damage. One hardly thinks of using bacteria as a source of x-rays, far from turning them into the brightest among such sources. The experiment consists of a femtosecond, infrared, high intensity laser irradiating a glass slide coated with E. coli bacterial cells, turning the cell material into a hot, dense plasma. Laser driven plasmas have been known to be very useful table top x-ray sources and efforts are constantly being made to improve their brightness. One such effort, an important one, has been to create plasmas on a nanostructured surface where the nanostructure amplifies the incident intensity by electromagnetic local field enhancement. 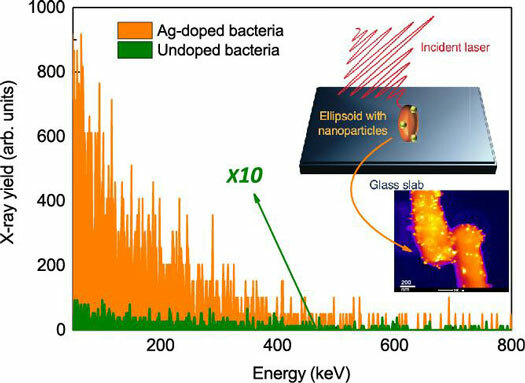 The present advance has been made possible by the insight the researchers had when they realized that natural micro and nanostructures in the bacteria can be readily used for such intensity enhancement leading to hotter, brighter plasma. They showed that the bacterial cells increased the x-ray flux by a factor of 100 in the 50 - 300 keV x-ray region. Further they grow the bacterial cells in a silver chloride solution whereby the silver atoms aggregated as nanoparticles inside the cell. They could then use these bacteria spiked with nanoparticles to boost the emission another 100 times, leading to an overall enhancement of 10,000 times from the flux emitted by plain glass slides without the bacterial coating. This is the highest conversion of laser light to hard x-rays ever achieved. This lateral stride could potentially lead to biologically inspired plasma physics and high energy density science with myriad applications among novel particle sources, creation of extreme excited states and related areas.